Only a trained pest control professionals can help you with complete and effective flea extermination. Pest Pro Exterminating can not only help you get rid of your fleas, but also help give you tips about how to prevent a flea infestation in the future. These small, wingless insects are long and have piercing and sucking mouthparts. They have great jumping legs and are covered with backwards-projecting spikes that allow them to move between the hairs of their host. There are many warning signs of flea infestation. The first and most common would be constant scratching and grooming by your pets. Your pets will also have red spots where the fleas drew blood. The most commonly targeted places is the hind quarters of a dog and the head and neck of cats. Fleas can be seen moving between the hairs of your pets and will leave black and red droppings behind. Fleas may transfer to humans, though they do prefer animals to humans. Their saliva can cause allergic reactions and their bites can cause skin irritation and ingrown hairs. Adult fleas will drink the blood of their host animal (usually a cat or dog). The female fleas will lay more eggs after each blood meal and they will hatch in about 10 days. This vicious cycle can go on forever if untreated. The eggs are laid in the host animal’s fur and bedding, so it is important to check both for flea infestation. Vacuuming is a good way to draw fleas out. 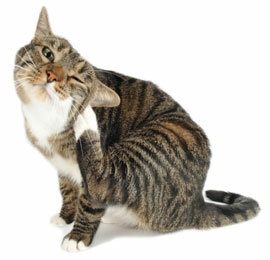 There are many treatment products for fleas on your pets. It is important to utilize flea prevention products so that you limit the probability of fleas entering the home and becoming a nuisance. 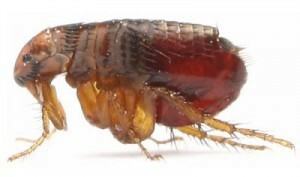 Catching the fleas early will limit their impact on your home, family, and pets. Contact Pest Pro Exterminating today for flea extermination!